Republicans in Washington are upping the ante when it comes to destroying health coverage gains that resulted from the Affordable Care Act. In addition to eliminating provisions that protect and ensure affordability to millions of Americans, the GOP has added provisions that would eliminate Medicaid expansion. Thirty-one states and DC were able to make significant coverage gains once they expanded Medicaid. Even though North Carolina’s Senate and House leaders continue to block expansion and thus leave 500,000 North Carolinians in the coverage gap, the leaked plan has provisions that will greatly impact North Carolina’s Medicaid program. The latest plan would restructure Medicaid into either a block grant or a so-called “per capita cap” program. Conservatives claim that the aforementioned proposals will offer states more “flexibility,” but that’s really just spin designed to camouflage what’s really being proposed — slashing funding for programs that help vulnerable Americans live up to their full potential and contribute to their communities. Currently, the federal government funds 66.7 percent of Medicaid spending. In other words, for every $100 in Medicaid spending, the federal government pays $66.70 while the state funds the remaining cost. Block grants and per capita caps would reduce the federal government’s commitment to funding Medicaid. North Carolina’s Medicaid program likes to boast of the high provider participation it enjoys, but that will change dramatically if the promised cuts are enacted. If states no longer get significant financial support, North Carolina will likely have to cut services. Eighty percent of Medicaid beneficiaries in North Carolina are among our state’s most vulnerable. These are children, seniors, and people with disabilities. Even with a per capita cap, there is not guarantee that that set amount each person receives for Medicaid will meet the costs for their health care needs. Even if North Carolina lawmakers want to keep coverage at current levels, trends show that per capita spending always exceeds actual economic growth. The bottom line: State lawmakers must be prepared to act and minimize the damage if the federal government heads down this road. They must also consider how proposed changes in Congress will impact the Medicaid reform proposals that the state recently submitted. 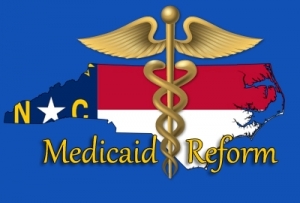 The Medicaid reform waiver states that North Carolina’s new Medicaid program will lead to: 1) Better experience of care, 2) Better health in our community, 3) Per capita cost containment and funding stability, and 4) Improved provider engagement and support. These kinds of changes won’t happen merely through wishful thinking. To maintain viable and effective Medicaid system in these difficult times, we will need our state leaders to stand up for North Carolina’s providers and the most vulnerable.